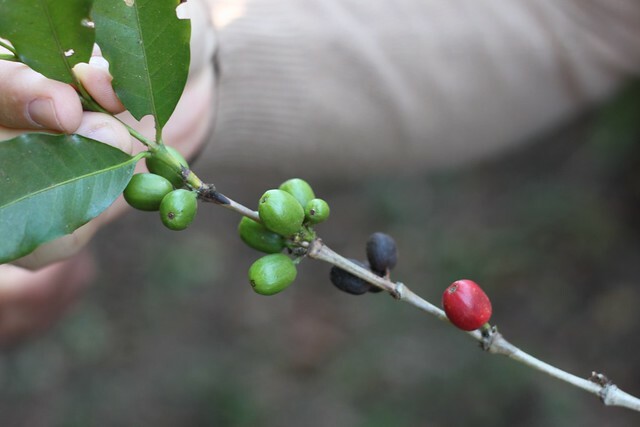 Daterra grows several varieties – or cultivars to be accurate: Mundo Novo, Bourbon, Catuaí, Icatú and Acaiá, and several of these in both red and yellow varieties. 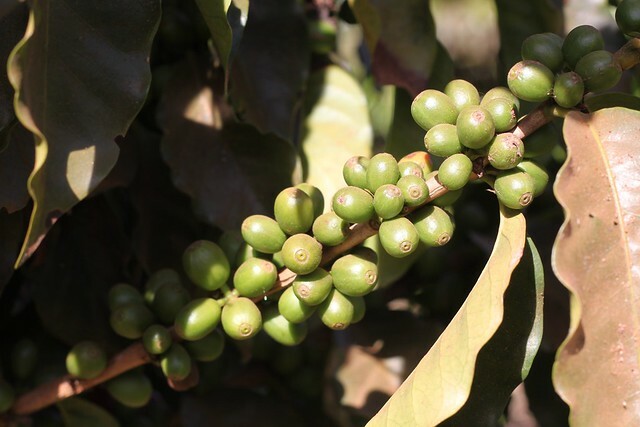 Besides those there’s also some experimental cultivars, amongst those the Aramosa, which is a low-caffeine crossing of the species Arabica and Racemosa that Daterra was part of developing. 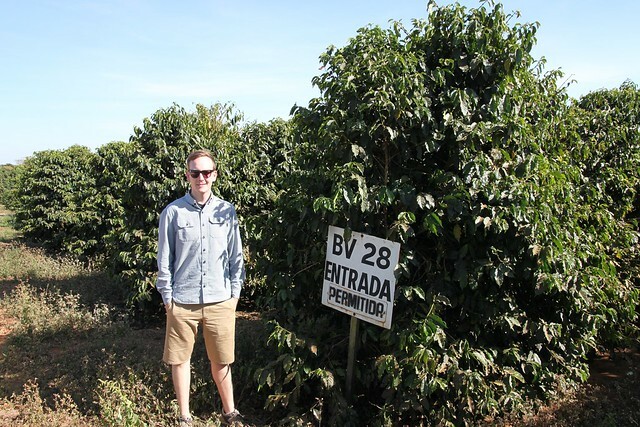 The farm have its own nursery for planting and attending new coffee trees. 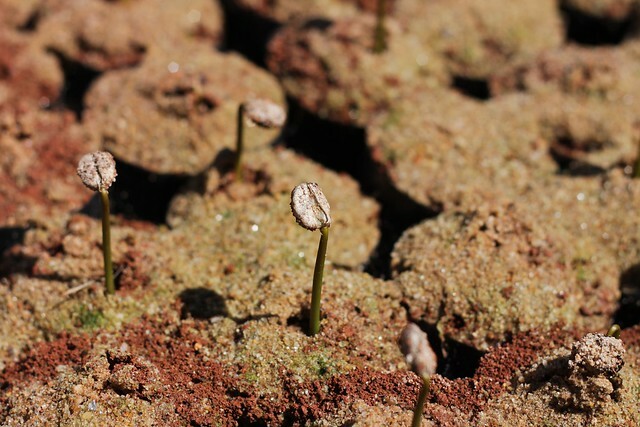 The sprouting is called “Little Soldiers” from the look of the bean shooting out of the ground. Gustavo showed me how extremely important it is that the root system grows straight down from the very beginning. Otherwise the roots won't bring the nutrients efficiently to the rest of the tree. The tree will then perform badly and eventually it might die. Here’s a good example of a very bad root. 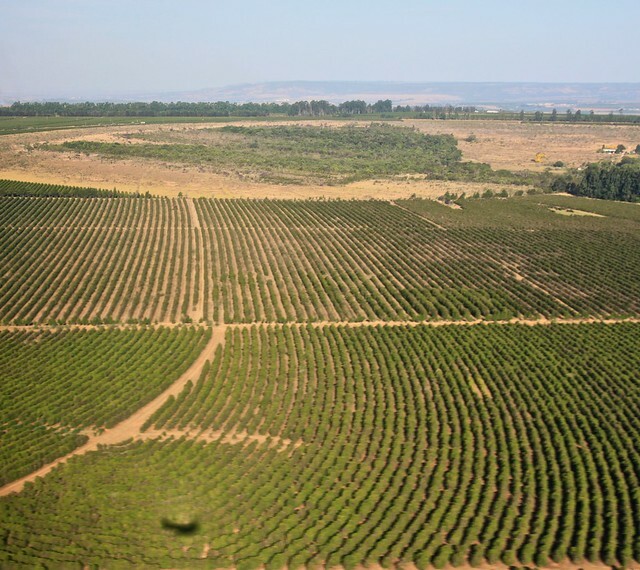 In average Daterra plants 4.000 trees per hectar. Typically for Brazil the trees are planted in very long rows with sections in between for the harvesting machine to dump the cherries in a truck. I took this picture when we flew back from the farm. The agronomists on each farm decide when and how to prune the trees; stumping, pruning the sides or simply the top. You loose two to three year’s harvest when you prune, so it’s a careful consideration. I visited a lot where the coffee trees have been allowed to grow wild since 1973 and the trees were now around 4 metres high. Potentially they could grow higher but these ones had started to slant to the sides and in stead increased in the size of the trunk. It was quite fun to see the the size of the trees though and to see the many young coffee trees growing wild underneath from the cherries that had fallen to the ground. This year the harvesting began quite early due to a very strange flowering last year. A coffee tree in most areas flower once a year following (heavy) rain fall. 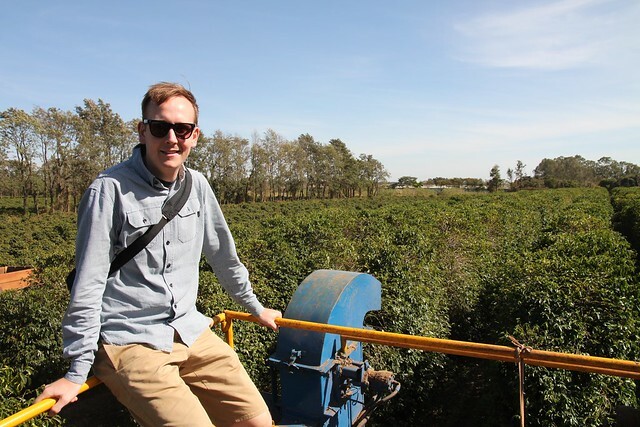 The green coffee then ripens for somewhere between 8 to 10 months. Around week 30 after the flowering season (meaning flowering is week 0) Daterra collects samples from all the different fields/lots that are then processed, dried, hand sorted, roasted and finally cupped by Carlinhos. From that cupping they decide when the harvesting of each lots should begin. I’ve never before encountered a farm who had this approach to determining the harvest time. It’s very impressive! Most farms will go by the color of the cherries, when deciding when to harvest. I’ve also seen others measure the sugar content and Daterra has also tested this is in the past, but decided not to rely on it. It simply didn’t give results that matched when it was best to harvest from a taste-point-of-view. 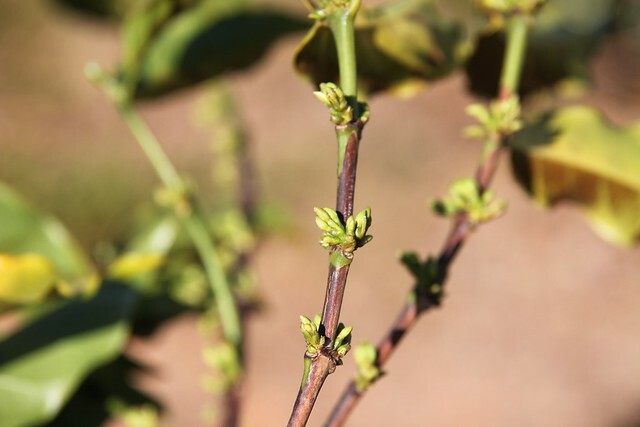 Usually the harvest than begins around week 40 after flowering, but this year they had to start already week 31 – just a week after cupping the lots. As I mentioned earlier the flowering this year in Brazil was sort of strange, resulting in very different ripening stages on the same branch. 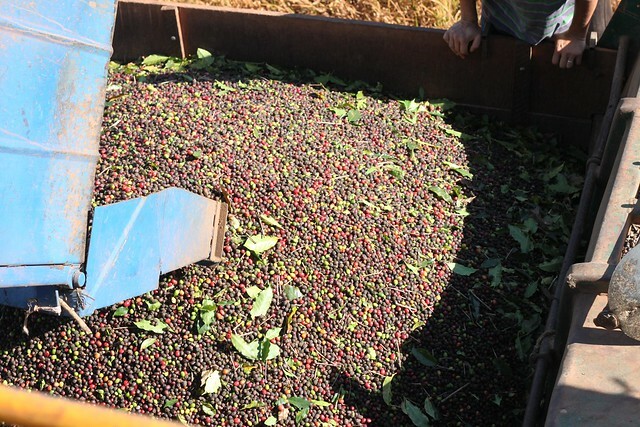 Harvesting in Brazil is done in most places with machines. The few who do hand picking, usually don’t do selective hand picking of only ripe cherry, but in stead stripping – which is removing everything from the branch. The machines Daterra uses are quite different than the other machines I’ve seen in Brazil. They look the same but functions differently. 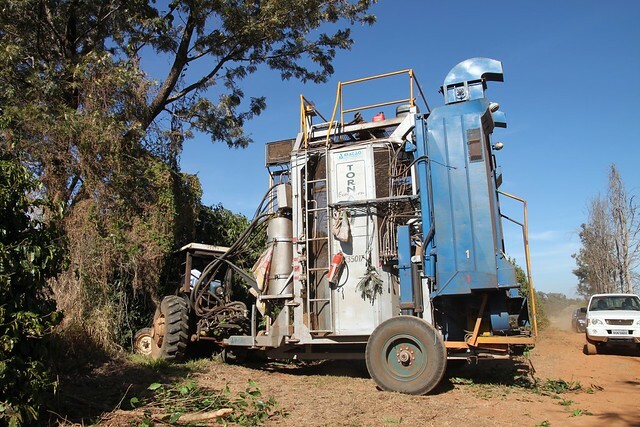 The whole machine drives over a row of coffee trees, 2,5-3 metres height I’d guess. Inside there’s many small sticks made out of a bendy material. The sticks vibrate gently and shake off the cherries from the tree. In the past I’ve seen similar machines, but on those the sticks were rotating and thus stripping all cherrys and lots of leaves off the branches. Naturally it’s a bad idea to remove the leaves as you’ll have less photosynthesis happening. With Daterra’s machine I was impressed to see how few leaves were taken off and that no branches while I observed were damaged. The cherries, just like a ripe apple, will fall of quite easily compared to the unripe. 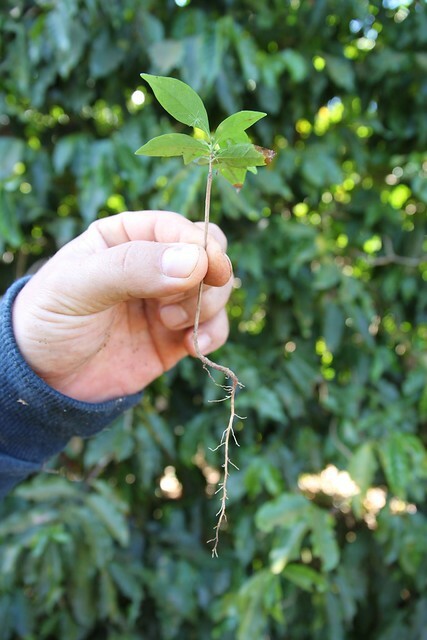 So Daterra can actually harvest the same rows 2 or 3 times. 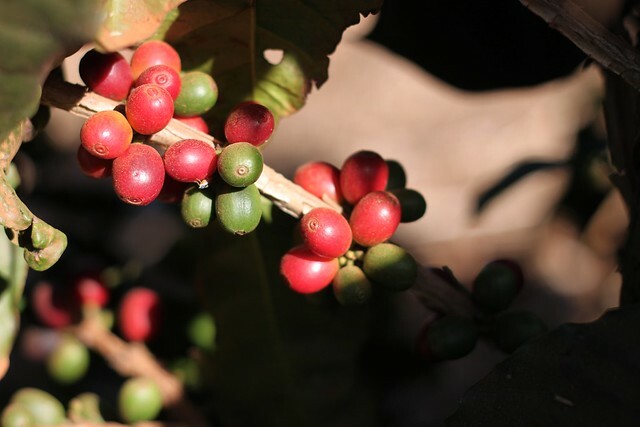 I came at the very end of the harvest season, though, so most of what was left were the Raisins – the over-ripe cherries that become natural processed coffee. Straight after harvesting the coffee will go to the Wet Mill for processing.